A QUICK NOTE: These restaurants are hand picked by our editors. We maintain anonymity as much as possible. We pay our own way. And we list only what we love. Period. PRICE GUIDE: $ INEXPENSIVE (Meals under $15) $$ MODERATE (Mostly under $25) $$$ EXPENSIVE (Mostly under $50) $$$ VERY EXPENSIVE ($50 and above). Price classifications are approximate and based on a typical three-course dinner for one person, exclusive of drinks, tax, and tip; unless otherwise noted, these restaurants accept most credit cards. ORIGINALLY PUBLISHED: In the print edition of Los Angeles magazine. Aloha spirit lives in Culver City. Roy Choi says A-Frame has always been Hawaiian—at least in the abstract—but an overhaul gave chef Johnny Yoo carte blanche to create full-on island fare. Loco moco and huli-huli chicken channel tradition, while a baby octopus terrine with foie gras and the sloppy kimchi burger take delicious liberties. The name of this charcuterie-driven New York transplant is an homage to Belgian cycling legend Eddy “the Cannibal” Merckx. (The owners like to pedal: Show up in a bike jersey—there’s a bike valet nearby—for a free second beer.) The lamb tartare comes blanketed in aged goat cheese shavings. Wash it down with an imperial stout you’ve never heard of, and move on to the grilled eggplant smothered in bone marrow. Bryant Ng mines his Chinese-Singaporean heritage, honors wife Kim’s Vietnamese background, and works in the wood-grilling technique he honed at Mozza. The result is the grand Southeast Asian brasserie that Los Angeles seemed destined for. Hunker down at a table on the patio to devour burnished pig’s tails with butter lettuce and fish sauce, or belly up to the raw bar for a dozen oysters with sambal cocktail sauce. At this indoor-outdoor daytime spot (named after a comet), Jordan Kahn rigorously imprints a Nordic aesthetic on his vegetable-forward California café menu. Roasted tomatoes and halved gooseberries nestle in a pool of kefir and roasted kale oil; avocado wedges rolled in roasted seeds and nuts are separated by sorrel leaves; pea tips and tendrils garnish a stack of fried cheese dumplings. Throw in an ambient soundtrack and a whitewashed open kitchen, and the effect is otherworldly. A few blocks from the Santa Monica Pier, this marketplace and restaurant articulates something fresh about vegan cuisine. Nick Erven pushes beyond simulations of meat that have become the plant-based norm. A deep sear on the plancha lends onion bread pudding the hominess of diner food. If the aim is to be good to one’s inner self, it’s veiled by enough Rioja, sauerkraut doughnut holes, and seaweed “Doritos” to make the theme optional. Evan Funke is a pasta purist who can slip Italian lessons into any meal. He did it first at Bucato in Culver City and now presides at Felix, a clubby, floral-patterned trattoria that occupies the former home of Joe’s in Venice. His tonnarelli cacio e pepe, a skein of strands adorned with cheese and black pepper, nods to Roman shepherds who used the spice to keep warm, while the rigatoni all’Amatriciana with cured pork cheek sings brilliantly alongside Italian country wines. At the apex of Abbot Kinney’s affection for beach-chic fashion and the freshest of local produce sits Gjelina, the first of Travis Lett’s growing cadre of Westside restaurants. Wood-fired small plates come to the table aggressively dressed, like the grilled leaves of Treviso radicchio served with an unconventional bagna cauda or sweet roasted parsnips in hazelnut picada. Don’t be surprised when you’re seated at one of the always crowded communal tables, where pizzas battle for space alongside glasses of Rebula. The kimchi is as fiery as any near Western Avenue; the brisket, as rosy and fragrant when it hits the grill. Down to its last crisp shards, the pan-jun, a seafood pancake thick with scallions and shrimp, is on par with the archetype that has been luring Angelenos to Kobawoo House since 1983. The cooking is authentic with an asterisk, evidenced by an uni-topped steamed egg. Brian Dunsmoor’s menu lends new meaning to the term “SoCal,” with grilled okra spears, vermouth braised rabbit over Antebellum grits, and a pile of ham masquerading as a salad. The Old Man Bar in back puts out superb cocktails, but Maxwell Leer’s wine program—which plunks peanuts in chenin blanc and mixes whites with soda pop—tests boundaries in a way that will amaze as much as it befuddles. You might know Nyesha Arrington from her appearance on Top Chef or from her days leading Wilshire restaurant. After dining at Leona, we primarily think of her as the woman who hand-pinched our lamb belly wontons and topped them with crisp artichoke slivers. It’s hard to nail down the genre here: There’s a Mexican seafood cóctel in a chilled tomato-watermelon jus, hippie seed crackers jutting from house-made cheese, and savory beef hearts emboldening the meatballs de corazón. Sang Yoon is doing to the cuisines of Southeast Asia what he did to ground beef at Father’s Office next door. The spicy chicken pops are a lesson in the tingling effect of Sichuan peppercorns. A whole steamed fish, slathered in black bean ghee and topped with cilantro, is promptly devoured. As at Father’s Office, beverages are well thought out. The crab melt with shrimp chicharrones is a burst of maritime flavor. The hot pots that arrive bubbling at the tables are deservedly a hit. Salad greens are beyond fresh, while the OG “Pioneer” bread nods to local history. Order the granita-like “Crank’d” for dessert and watch as the ice and frozen fruit are ground by hand. It was a gamble to create a monthly menu based on a single ingredient in glamorous Beverly Hills. But celebrity chef Curtis Stone has pulled it off. Each season has a theme: Autumn salutes pears, which Stone caramelizes to bring out the gentler notes of braised veal cheeks. In winter he turns to white truffles. When the weather warms up and it’s time for citrus, the motif glows as brightly as ever in the hit of foamed lime that sits atop a crisp Indian onion bhaji, or fritter. Since it opened in 1999, Josiah Citrin’s two-star Michelin Award winner in Santa Monica has never wavered from celebrating the difference between eating and dining. That his trademark curl of fresh pasta with lobster bolognese and brown butter truffle froth and the poached egg garnished with caviar remain staples isn’t a sign of stagnation but evidence that he got it right the first time. Since starting at Michael’s, 28-year-old chef Miles Thompson has reinvigorated the venerable institution. (Restaurateur Michael McCarty practically bounces through his goodwill tour of bar and garden tables.) Cocoa nibs add the perfect crunch to pillowy rabbit meatballs with English peas. Tiny leaves of just-snipped mugwort balance the brooding force of black rice and baby turnips. Each bite captures that old Michael’s magic, an alluring spell of on-point food and good conversation in the night air. Niki Nakayama tailors the rituals of kaiseki dining to a bungalow in Palms. The multi-course dinner is high formality without the airs. Dishes begin arriving soon after you are seated. Whether in a skein of spaghettini with paper-thin abalone, a seared Wagyu slice with a blistered shishito pepper, or diced shiitakes folded into a butter sauce over Alaskan king crab, a pointillist intensity comes through in every dish. The Rose Café, a Venice institution, isn’t the same as it once was. But this reincarnation is pretty tasty. Chef Jason Neroni whips up breakfast burritos, kale salads, and other classic beachside fare alongside such signature dishes as cacio e pepe and a cauliflower T-bone smothered in almonds and shishito piperade. A case full of baked goods delivers a rock-solid Gjusta impression. Chef Jeremy Fox has bestowed great energy on a Santa Monica fixture that has always been as mellow as a day at the beach. His market-driven approach is thoughtful without being ponderous and always pretty on the plate. The results are consistently delicious. He reduces French onion soup to its essentials, pouring a burnished consommé over pickled ramps and a crouton bubbling with Gruyère. The pozole, made with Rancho Gordo hominy, is thickened with green garlic and studded with clams; it’s a pure rush. The bartenders are a blur as they shake out Negronis for a thirsty crowd at this hangar-size spot. Trained at Spago, Antonia Lofaso understands high-volume cooking, and her take on hearty Italian-American is respectful yet inventive. For the squash blossoms, she mixes ricotta and mozzarella in the filling for more stringiness. In the eggplant and caper caponata, she adds crunch with freshly roasted almonds. The kitchen where Steve Samson tends the fires would be the focal point if there wasn’t so much happening on the plate. Cauliflower florets and cured lemon duel beneath a grilled mackerel scapece. An egg, presented sunny side up, cooks in a bowl of minestra, a country soup chock full of wild mustard greens, just as it would in Umbria. Following 2012’s overhaul, Wolfgang Puck’s flagship restaurant has turned into a streamlined space that’s striking enough visually to draw out the nuances of Lee Hefter’s cooking. There’s vitality when the cushioned house style is applied to the jagged edges of contemporary dining. Binchotan charcoal, wild nettles—they’re all here. A thin layer of smoked mascarpone tops the veal tartare in a marrowbone. The appearance of white corn agnolotti is still how the peak of summer is announced in Beverly Hills. Josh Loeb and Zoe Nathan have remade the old Marix Mexican restaurant into an irresistibly fun beach spot. Chef Mario Alberto’s seasonal menu is filled with such creative dishes as duck chilaquiles and favorites like nachos that arrive piled on a baking sheet and begging for a margarita or two. Reservations go fast, but half the tables are held for walk-ins. Andrew Kirschner’s laid-back restaurant combines creativity and smarts. Bruschetta toppings are updated on a blackboard, and really, who’s going to argue that a chili crab cake hardly belongs on a Cal-Med menu? Wood-fired flavor is the animating spirit of these small plates. With advance notice, the kitchen can cook a standing rib roast or even an entire goat, but none is needed for the whole fried snapper. Oven-roasted peaches are the perfect coda to a meal. Josef Centeno’s umlaut-bedecked flagship has all the Moroccan bistilla and Provençal brandade you could want. The signature bäco sandwich may hold beef carnitas and pork belly dripping with salbitxada—an almond and onion sauce you haven’t seen outside of Barcelona—but the thrumming kitchen has the spirit of a time-tested hash house, turning out such efficient and brilliant combinations as hamachi crudo with crushed avocado and hash browns as well as crisp ricotta fritters with honey, lemon zest, and dill. Josef Centeno brings the flavors of his Texas heritage to 4th and Main and, in doing so, redeems an entire cuisine. In the same adept hands that preside over neighboring restaurants Orsa & Winston and Bäco Mercat, Tex-Mex classics such as Frito pie become towers of lengua chili-doused corn chips in a poquito cast-iron skillet. Short fideo noodles form a bed for bits of octopus and smoky sausage. All hail the flour tortilla and the curiously viscous queso dip. Ori Menashe and his wife Genevieve Gergis envisioned a warehouse east of downtown as a testa-serving, guanciale-curing, pasta-extruding temple of authenticity, and darned if they didn’t achieve it. Menashe lights up beef heart tartare with champagne vinegar and boosts grilled orata with an anchovy-and-lemon paste. Gergis’s panna cotta with persimmon wedges ends a meal—whether it’s lardo-draped pizza or brothy cassoeula—on an exquisitely soft note. Ray Garcia draws inspiration from domestic braises. His tender rabbit with bacon and nopales speaks to hours spent in the oven, but even a freewheeling tangle of purslane-dusted chanterelles radiates hominess when heaped onto griddled masa. The charred eggplant enchiladas are crafted from heirloom-corn tortillas. For the “Abuelita” hot chocolate, Garcia goes straight for an homage to the Nestlé brand but with high-grade cacao. These deluxe ingredients heighten what’s already compelling: a chef fluent in the language of modern cooking who celebrates the family table. At Ray Garcia’s downtown taco shop, the tortillas are handmade from heirloom corn. Fillings include a sultry mixture of Manila clams and shavings of lardo, or perhaps cubes of house-made mortadella laced with mayonnaise. On Thursdays Garcia prepares pata verde, a crackling pork shank in green chile sauce. On Fridays it’s whole snapper Veracruz. Even the cabbage showcases bits of pickled pig’s skin. Agave spirits spike the cocktails, but the most popular drink may well be the can of Tecate rimmed with salt and hot sauce and presented in a paper bag. Perfecto. Angelo Auriana led the kitchen at Valentino for more than a decade; restaurateur Matteo Ferdinandi was a business partner of Celestino Drago. Together they champion northern Italian fare: silky handkerchief pasta smothered in pesto, plump casonsei dumplings sautéed in sage butter. A grand restaurant that’s seemingly custom-made for entertaining guests of L.A. Live, Faith & Flower hits hard with dishes that span the flavor spectrum. Bone marrow thickens the sauce for petite oxtail agnolotti; shards of puffed beef tendon add the crunch. An anchovy-and-crispy-shallot salt bomb transforms grilled bok choy into drinking food. The balancing act taking place in the Milk Punch has earned the bar program rightful acclaim. Finish with a Straus Greek yogurt panna cotta topped with yuzu granita, puffed rice, and rubylike pomegranate seeds. Panic sets in somewhere around the fourth bite. The flood of capsaicin takes hold, your adrenaline spikes, the sweat starts to drip, your nose begins to run, and you realize there’s no turning back: The crunch, the juiciness, and the cayenne-smacked transcendence of Howlin’ Ray’s Nashville hot chicken has you hooked. As you reach bite five or six, you think maybe the kitchen got your ticket wrong. You played it safe and ordered the medium—it shouldn’t hurt this bad. But with Johnny Ray Zone shouting orders down the line and his army of cooks barking back “Yes, chef!,” you get the sense that this tightly run ship doesn’t often stumble. Hauser & Wirth is a powerhouse of contemporary art, much of it trading in edgy provocation. But the gallery’s restaurant is downright homey. The best dishes reflect chef Wes Whitsell’s Southern roots: smoked pork shoulder with greens and cider; half chicken with dirty rice. The menu touts farmers’ market produce, but we’re here for the Redneck—prosciutto, pimento cheese, biscuits, and deviled eggs. When a restaurant lists three varieties of regional risotto grains on the menu, you know it’s not kidding around about Italian. You can’t miss the roaring wood fire lighting up the glass-enclosed kitchen; it’s responsible for the prized slow-roasted pork shank and the prime rib chop. There’s an overly sweet dressing here, a temperature issue there, but that won’t keep us from ordering the chestnut pasta with quail ragù. In this minimalist venture, Josef Centeno gives us his most austere yet farthest-reaching restaurant. The format is limited to multi-course tasting menus ranging from $80 to $225, along with a few à la carte dishes of what he calls “antipasti,” such as grilled geo-duck with shaved fennel and diced pomelo. Crumbled furikake seaweed and good olive oil create a sauce for thin slices of testa. Cooked like a risotto and capped by San Diego uni, the satsuki rice nears evanescence with yuzu-pecorino cream. If ever there was a restaurant that invites gawking, Otium is it. A cube of polished wood with Miesian girders, the Broad Museum-adjacent eatery takes full advantage of its 20-foot ceilings and loft-like space. The plates are heavy speckled stoneware and sport chef Timothy Hollingsworth’s globally inspired but unmistakably California cuisine. Delicate morsels of hamachi are crusted in nori powder and served raw next to a painterly schmear of avocado. His influences are made clear in a funnel cake: a spiderweb of fried dough topped with airy dollops of foie gras mousse and preserved strawberries. This is the first time Josef Centeno has tried his hand at a style of cooking that is almost entirely produce oriented. Grilling over binchotan coals brings out the twilight sweetness in last-of-the-season figs. Shaving walnuts on a Microplane allows Centeno to shade pristine baby carrots with a pesto made from their tops. The saline kick from grated Paski Sir—a Croatian sheep’s milk cheese—adds umami to creamy grits. Thickly cut San Marzanos (from a Lincoln Heights charter school garden) are at their most lyrical between flaky pastry and a swirl of crème fraîche. Hiroyuki Naruke specializes in a profound style of sushi rarely seen stateside. Fish for the seasonal omakase menu is prepared with exactitude. Translucent wafers of Korean fluke are wrapped in kelp to cure; sayori (needlefish) is slivered and marinated in soy; and tender lobes of rich uni are glazed with miso. Naruke’s magnum opus may be a simple, luxuriant slice of tamago. The custardy egg omelet serves as dessert with just the right (slightly) sweet note—a humble cube of gratitude to end the night. Neal Fraser has defined his own kind of L.A. elegance over the 20 years he’s been cooking in his native city. For him, setting up shop in the decommissioned St. Vibiana’s Cathedral offers an opportunity to add theatrics to a style that’s contemporary and classically plush. Truffles and lentils transform slices of smoked tofu from wholesome to haute, while lamb belly spins on a spit in the former rectory. As if the interplay of Aleppo pepper and sumac weren’t dramatic enough, a retractable ceiling reveals the illuminated bell tower. At 950 feet in the air, the mountains-to-sea view is dramatic, but Vartan Abgaryan gives you plenty to gaze at on the plate. A sliver of foie gras terrine rests languidly beside grilled, big-crumbed country bread. Tart mustard seeds contrast with the char of an octopus tendril in the same way crackling chicharronnes play off a refined arrangement of king crab petals. David Schlosser focuses with Jedi determination on a type of cuisine known as kappo, which in Japanese means something like “to cut with a kitchen knife and cook with fire.” The chinmi, or “rare tastes,” might include lobster fermented in its tomalley (i.e., guts), jellied sea bream skin, and irizake—pickled plum cooked with sake. In kappo fashion Schlosser creates his elaborate meals at a counter in view of guests. Details reflect the chef, extending to the cypress bar’s brass joinery, glasses with thread-thin stems, and the occasional dish served in a Meiji-era bowl. If you order the steak tartare at downtown’s new Francophile destination, take a moment to inspect the diced olives, fennel, tomato, and celery. Try to find a single minuscule cube that isn’t identical to its neighbor. You won’t. Tony Esnault’s food may have the precision of classic French, but Spring never feels rigid. An intricate dessert of Cara Cara oranges, meringue batons, and panna cotta proves that even fancy tweezer food can be soul satisfying. Gino Angelini grew up on his grandma’s green lasagna in a village outside the Adriatic resort city of Rimini and came to L.A. to help Mauro Vincenti with Rex in the mid-’90s. He’s not above finishing a crostino of lardo with white truffles, but his wheelhouse is a more understated realm: The soup is thick with soft potatoes, tripe is buoyed by a slow-cooked soffritto, and all those veal kidneys need is cooked-down onions and a splash of wine. At the first of their two Fairfax District enclaves, Jon Shook and Vinny Dotolo have maintained—even honed—their knack for rejiggering comfort food into balanced, thoughtful dishes that leap with spurts of acid and fat. Charred onion pho dip with tendon puffs could rule any Super Bowl spread, while the truffled toad-in-a-hole resembles an amplified riff on the croque madame. Unforced and driven by culinary excellence, A.O.C. is anchored by a courtyard with soft sunlight and laurel trees. Caroline Styne’s wine list doesn’t shy away from the ecology of vineyards, while Suzanne Goin’s cooking has become indispensable. The tarragon burrowed in Little Gem lettuce with green goddess dressing is an ideal. The roasted chicken heaped on a torn-crouton salad with wilted radicchio is an homage to San Francisco’s Zuni Café—a tip of the hat only a great restaurant can bestow. Nottingham-born chef Brendan Collins is onto something with his ambitious 16-table restaurant plunked into the Cahuenga Corridor. Old England is there in the toffee pudding, but Collins is strongest when cheering the multiethnic United Kingdom of today with skewers of monkfish tikka masala under petals of papadam. The lamb belly with peas and bacon suspended in a foie gras sauce comes pretty close to defining “craft.” Well, that’s probably to be expected from a chef who worked under London’s Marco Pierre White. At this Mozza team addition to the corner of Melrose and Highland, a passion for butchery is palpable. Diaphanous sheets of speck and pucks of fried trotters are piled onto picturesque salumi platters. The beef and marrow pie is stuffed with beef cheeks, cipollini onions, and mushrooms. A behemoth tomahawk chop—for sharing—comes to the table as the coup de grâce. Nancy Silverton’s pane bianco is there to soak up all the drippings. The rustic charm of fried clam bellies and a loaded lobster roll have New England transplants (including chef-owner Michael Cimarusti) feeling homesick. At the raw bar a tatted-up crew lops off the spines of sea urchins and shucks oysters from both coasts. That’s linguiça heating up a Portuguese fish stew, and house-smoked albacore beneath a pile of arugula. But Cimarusti knows that sometimes the best way to prepare fish is to just grill it. Sascha Lyon’s neo-brasserie sets a high mark. Praliné grains tease out the pleasing bitterness of Castel-franco radicchio, and duck fat fries ride alongside grilled hanger steak. Sauces are a strong suit. Order the kabocha pudding cake. A breakout restaurant from two Animal alumni—chef-partner Jonathan Whitener and managing partner Lien Ta—landed on a K-town corner. The cocktails are considered, as is the decor (a lone photo of Morrissey, a splash or two of craft-chic geometric patterns), while Whitener’s menu is freewheeling. Slices of raw hiramasa alternate with precisely cut radishes and are served with serrano chile emulsion and charred onion powder; a whole dry-aged Peking duck comes with arepas instead of Chinese pancakes. Somewhere on the menu rife with things like deconstructed poutine is an invitation to set aside preconceptions and simply taste. Ink. has earned our respect with its attentive service and chef-owner Michael Voltaggio’s dedication to originality. He corns lamb belly so that it radiates a pastrami-like richness. The salt-and-charcoal-roasted potato ignites when spritzed with black vinegar, and the house-made “Doritos” (they could pass for vegan chicharrones) are superb. Jon Shook and Vinny Dotolo’s homage to the neighborhood pizza joint is an in-demand reservation because the food is so darned good, not because the two guys are stars. The Italian canon is prepared with the signature gusto of their first venture, Animal, but there’s also a more rarely seen delicateness. An eggplant slice dipped in egg wash and carefully fried ensures that this parmigiana showcases stewed San Marzano tomatoes instead of oil. Rather than bacon bits in the frisée aux lardons, chef Kevin Meehan adds crackling duck skin to the ruby-streaked greens for texture. Kali never strays too far from the bistro fare that once characterized California cuisine, but the restaurant doesn’t play it safe, either: Witness the honey-glazed and seared avocado halves or the Flannery Beef filet mignon served over fire-roasted onion that come to the table with bulb, stalk, root hairs, and all. Sarah Kramer and Sarah Hymanson of Madcapra have expanded beyond falafel with Kismet, an all-day restaurant specializing in California-fied versions of Middle Eastern classics. The “Turkish-ish Breakfast” is an enormous spread of cold morning fare with a sesame-sprinkled hunk of Bub & Grandma’s bread. At dinner a platter of rabbit feeds two and comes with triangles of pan-seared “flaky bread” for swiping through a rich stew of curried chickpeas. Patina and French Laundry alum Gary Menes harnesses the vitality of fresh produce that he grows himself in a community garden to create thrilling renditions of the classics. Here “velouté” might mean silky cauliflower poured over fried bread crumbs in a locally handcrafted bowl. Rather than a slice of venison, the “tranche” is a deeply roasted crescent of butternut squash scattered with wheat berries. The first in Caroline Styne and Suzanne Goin’s necklace of restaurants, Lucques is still as vibrant as the day it opened. From the roasted vegetables (they truly are roasted here) to the bright yet subtle sauces to punchy dishes like short ribs with sautéed greens, cipollini, and horseradish cream, the place is defined by a relentless sense of poise and ease. Kris Yenbamroong’s Thai canteen takes on the aggressive flavors of rural northern Thailand. Spicy crispy rice salad and links of sour pork sausage are bolstered by copious amounts of fish sauce, chiles, and dried herbs. A portrait of Pete Sampras looks on while you choose between sparkling gamays or plastic towers of Chang beer. An outdoor patio feels like a friend’s backyard. Boredom is impossible here. Southern flavors have been inflecting local dishes for some time now, but the subtle way they appear in Mike Williams’s lobster bolognese gnocchi and his Little Gem salad (the buttermilk dressing had us licking the plate) feels as fresh as a new pair of boots. The smoked tomato is a bit heavy-handed in the uni butter-poached shrimp, but fried hominy cakes with hot sauce have just the right drawl. When chef Quinn Hatfield’s namesake restaurant closed, he swapped toque for trucker hat and a dining room of muted tones for one of exposed brick and stacked logs. Using an arsenal of open-fire cooking methods, the chef has achieved his most soulful cooking. Cleaver-whacked smoked lamb neck is piled in lettuce cups with a swirl of green hummus, while razor-thin onion strings elevate a churrasco-cooked sirloin cap. Wife Karen’s desserts—such as chocolate pie with rye crust—prove yet again why she’s one of the best pastry chefs in town. 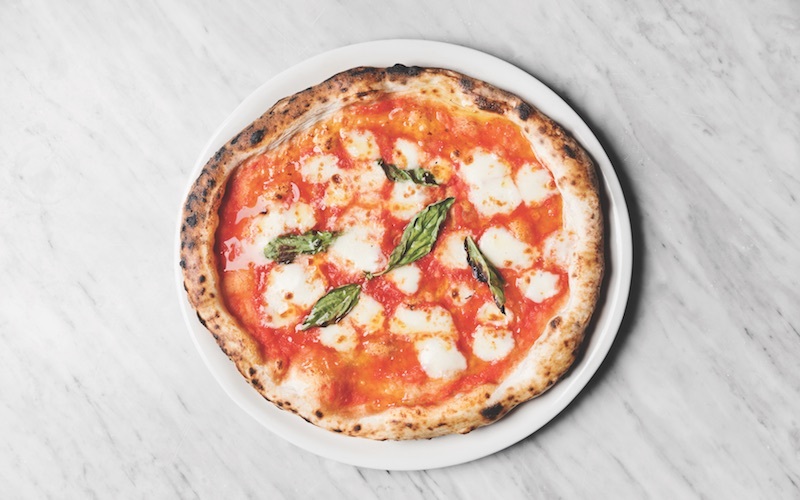 Mario Batali, Joe Bastianich, and Nancy Silverton’s osteria and pizzeria may share a street corner, but their true link is a fearless approach. The osteria strives for big-city elegance, with space in the dining room for an Italian cheese counter, where you can order something as small as burricotta with radicchio. But most people opt for more: sweetbread piccata or short ribs with fresh horseradish. Next door it’s about pizzas with billowing thin crusts and hearty toppings such as fennel sausage. If there’s one thing Angelenos and the French have in common, it’s the ability to make informal look so vachement cool. Petit Trois, Ludo Lefebvre’s take on a casual French bistro, is—like its neighbor, Trois Mec—a collaboration with Animal’s Jon Shook and Vinny Dotolo. Here a simple omelet with Boursin becomes a master class in egg cookery. Bread is for sopping up the melted butter left in the bottom of your escargot dish. Orient Express blue and English mustard yellow murals are outside; taupe banquettes and Art Deco fixtures rule the dining room. In this elegant garden spot that was once Terrine, Scott Conant practices a nuanced version of supper club Italian, where vongole balance on squid ink tagliolini and a robust rabe pesto lends a jolt to plump veal polpette. Donato Poto runs the Michelin two-star dining room, its walls the color of damp sand, while the kitchen walls can barely contain chef Michael Cimarusti’s passion for fish. Santa Barbara prawns grilled with a wisp of rosemary represent the West Coast; New Bedford scallops chopped into a tartare and served with sea grass and toasted brioche compete for the East. Cimarusti respects the pristine state of great fish so much that any additional ingredient has to earn the right to be on the plate. République may be devoted to French food, but its soul is Californian. Walter Manzke is as skilled at making Gallic garlicky snails in puff pastry domes as he is preparing roasted cauliflower with Coachella Valley dates. At breakfast people murmur over cast-iron pots of shakshouka. At dinner the strip loin— served with poached marrow—can be ordered in two sizes. Afterward it’s time for Margarita Manzke’s griotte tart. Zak Walters and Chris Phelps continue their locavore-meets-carnivore ways at their Hollywood digs. All ingredients come from within a six-hour drive of the restaurant, where they’re transformed into ham confit with shaved radish and broccoli rabe puree, or cotechino served in a pool of brothy flageolet beans. A flatiron steak is topped with bordelaise and béarnaise sauces, doubling down on the decadence. Jon Shook and Vinny Dotolo deliver a certain brand of sun-drenched seashore nostalgia. Dropping into the nautically themed dining room for chilled peel-and-eat shrimp and a hurricane feels as effortless as dipping your toes in the sand. There are buttery lobster rolls and fried chicken sandwiches alongside artfully plated crudos and uni-slathered burrata. Chef Stephen Kalt is rekindling his 20-year-old New York City flame in a corner lot on Melrose. Beautiful people scoop grilled avocado from beneath shaved slices of ricotta salata. Pizzas are multitudinous, but opt for the five-spice duck cannelloni instead: petite rolls that are at once lush and unadorned. That’s “bandage wrapped” cheddar in a sandwich, and what would “open-faced brioche toast” be without kale, an egg, and a shock of “lacto-fermented hot sauce”? Originally conceived as another outlet for Jessica Koslow’s splendid jams, Sqirl grew into the neighborhood commissary. Bacon serving but vegan friendly, attuned to the rhythms of a day in L.A. (breakfast until 4 p.m.), Sqirl is of-the-moment yet anchored by something deeper. An ambitious vision that’s been whittled down to 26 seats in a repurposed pizza parlor (and can be experienced only through tickets purchased in advance), Trois Mec is a restaurant of modulated grandeur and uncompromising standards. Ludovic Lefebvre grates Salers cheese onto potato pulp with onion soubise and bonito. Cooked over almond wood, ibérico pork reaches rustic heights accompanied by clams in a mustard-laced broth. Diego Hernández, the chef behind Baja’s celebrated Corazón de Tierra restaurant, is at his best when he focuses on that region’s simple pleasures: Oysters are grilled in their shells over oak and finished with a brown butter. Juiced sorrel is added to the masa for the tamales, which are served on a mole of toasted hoja santa and cloves. The former Dominick’s still boasts a spacious covered patio, the banquettes now outfitted in bold black-and-white stripes. Bartender Aaron Melendrez crafts cocktails that summon the flavors of the Baja countryside. The menu at low-key Wolf is the antithesis of Top Chef alum Marcel Vigneron’s foam-happy onscreen persona. Vigneron updates white miso black cod with a dashi broth that includes bobbing flecks of watermelon radish. The sweet sting of burnt carrots—their stems included—is mellowed by luscious coconut cream. Nicely pungent grated horseradish blankets fried potatoes crisped to their most delicious state. The blueberry soufflé is punctured with a spoonful of violet ice cream. Chef Zach Pollack navigates regional demarcations like a Fiat cutting between Roman buses. While the roasted escarole heart with Parmigiano-Reggiano and anchovy vinaigrette evokes something essential about the Italian cucina, the marsala-deglazed chicken livers tossed with maccheroncini spears summon the era of scallopini and spumoni. Pastas are, of course, a highlight here: Whole-wheat bigoli—tubular strands from northern Italy’s Veneto region—tap into an earthy realm. Every neighborhood deserves access to primo charcuterie, cacio e pepe, and pizzas decked out with soppressata and Calabrian chiles. The menu from Don Dickman includes sides such as braised pea tendrils, secondi like grilled lamb shoulder, and generous spreads of antipasti, salads, and cheese. Grab a table beneath the Sputnik chandeliers to indulge in pork loin milanese. The Komodo crew channels its Indonesian heritage with a sleek restaurant dedicated to beef-bone broth and chewy hand-cut noodles. Shareable meaty additions include a Flintstones-esque beef rib, oxtails, and golden Jidori chicken. The spicy pile of mie goreng pedas—fried noodles with a sous vide egg—might seem like overkill. It’s not. Figueroa Street is on fire. That’s where Cafe Birdie has landed, with its bistro vibe and seven-ingredient cocktails. The menu of mostly Cal-Med small plates—pork collar with salsa verde, fresh pastas with meaty ragù—also includes several toasts, which sound prosaic yet taste compelling, such as the one with tuna conserva and clams. Enter the speakeasy via the back patio. Why does no one blink an eye when they have to wait hours for a table at Chengdu Taste? Perhaps it’s the creeping, tantalizing heat of “water-boiled” fish or the nubs of cumin-rubbed mutton skewered with toothpicks. Most likely, they’re waiting to experience the electricity of Sichuan chili oil in a bowl of wontons. Your tongue will be numb for at least a minute—when feeling returns is when addiction sets in. Song means “two” in Thai, and with this Silver Lake outpost, Kris Yenbamroong continues his exploration of Thai regional cooking. A spread of nam prik dishes might contain tiny eggplants dressed with shrimp paste or a pork ragout that you heap onto pork rinds. Jungle curry bubbles in a Sterno-heated hot pot, its surface brimming with peppercorn strands, minced chicken thigh, and wilting herbs. For those who prefer more familiar territory, there’s always the som tum-topped fried chicken sandwich. An alum of Chez Panisse, Vivian Ku—together with her partner, Moonlynn Tsai—has infused the Taiwanese counter-service venture with smart sincerity. Quick orders of pickled daikon, pig’s ear slivers, and stewed bamboo shoots can be ordered straight from the deli case. Neighborhood denizens drop by for lard-seared scallion pancakes or potstickers stuffed with kabocha or spicy shrimp. This auto mechanic shop turned taquería in Frogtown showcases the Mexican-style grilling skills of Esdras Ochoa (Mexicali Taco & Co.). Dirt floors, cacti, and pastel school chairs set the scene for smoky meats (carne asada, al pastor, chicken) cooked over a wood fire and served Norteño style in flour tortillas. The patio draws crowds seeking micheladas and spiked aguas frescas, the makings of many a drinking fest beneath the palms. This chic ode to seafood—especially its tree-lined back patio illuminated by string lights and a fireplace—is a whole new level of sophisticated style for Silver Lake. The smoked trout-and-artichoke salad, fried chicken with creamy grits, and soft-shell crab sandwich on a squid ink-dyed bun all benefit from the setting. The supergroup of Ludo Lefebvre, Jon Shook, and Vinny Dotolo has made a thing of dropping destination restaurants into strip malls. Trois Familia brings the formula to Silver Lake. Pinto bean burritos with garlic brown butter are offered alongside chicken milanese crowned with cucumber curls. Double-decker potato tacos are what might happen when Lefebvre reimagines Taco Bell’s Cheesy Gordita Crunch. Izakaya food is meant for drinking, but there’s a subtlety to some of Tsubaki’s dishes—chawanmushi egg custard with Dungeness crab, raw Tasmanian ocean trout with salmon roe—that might be lost after the first few pours. For more serious swilling there’s a Southern spin on karaage, or fried chicken, that’s soaked in buttermilk and served with honey vinegar. Afterward there is lush house-made soft-serve, blended with slightly bitter roasted green tea. Bruce Kalman’s produce-forward Italian cooking is all balance and ease. He parries the cured intensity of prosciutto with peaches and pairs browned garlic with Fresno chiles in the spaghetti alla chitarra. The giadiniera is a signature: pickled florets riding the tang of house-cultured butter. Kalman butchers a whole hog each week, rolling the loin in belly fat and roasting the porchetta until the skin crackles. Angelenos love eating small, grain-heavy seasonal dishes with jolts of texture and acid, and Winsome has this as-yet-unnamed genre under control. The shaved cauliflower salad is all delightful crunch, spiked with lime, parmesan, and Bragg’s Nutritional Yeast Seasoning. Snap peas, kohlrabi, and broccoli spigarello are tossed with a lemongrass dressing that stars the sour Turkish pepper urfa biber. Justin Abram has taken over for opening chef C.J. Jacobson, who worked for a spell at René Redzepi’s Noma in Copenhagen. The forage-heavy ethos remains strong at this mellow Studio City street corner, where local produce is highlighted with a deft touch. That’s lovage butter you’re spreading on warm bread. The wildness of a sweet clover reduction lingers in a brined pork chop. Named after the Spanish word for “sunflower,” Girasol is as inviting as it is inventive. Ted Hopson’s tuna crudo is fanned out above a node of Calabrian chiles. His skin-on French fries? They are the culmination of a three-day process that leaves them stupendously crisp and moist. That taste you can’t quite put your finger on in the roasted vegetables is the schmaltz that the chef skims off his chicken stock. The Bellwether plays the hits found at any reliable neighborhood restaurant and adds another layer of delicious polish. Most nights it seems as if half the Valley is here, huddled at the bar for a peaty scotch cocktail or squeezed into a booth for a bowl of fennel-perfumed mussels. Top Chef graduate Antonia Lofaso understands the complex art of drinking food, but her Italian chops are visible in the buxom ricotta gnudi with brown butter and pistachios. The deep-fried fluffernutter sandwich is a reminder that food, like life, should not be taken too seriously. David Lefevre’s take on the American steak house is so midcentury plush, it’s an excuse to splurge. Whether that means ordering the top-grade Wagyu at $32 an ounce or the reasonable $30 flatiron steak, wet aged and darkened on the pulley grill, is up to you. For those opposed to large primal cuts of cow, consider the sea bream, which is cleverly deboned yet served whole with charred halves of lemon and orange that beg to be given a liberal squeeze. A premium raw bar near the beach shouldn’t be unusual, but it is. The same goes for velvety clam chowder. Here it achieves smoky richness—you can thank the Neuske’s bacon for that—without any floury glop. Crab cakes, too, are unsullied by bread crumbs, letting the pure crustacean essence shine. On the raw bar menu you’ll find several kinds of oysters, Peruvian scallops, and Alaskan king crab legs. Chef and co-owner Tin Vuong deftly translates the flavors of his native Vietnam for the casual Manhattan Beach drinking scene. Start with crispy tendon chips dusted with red curry spice. Soft-shell crab fills a loose interpretation of banh mi. Digging for pork belly inside a bánh xèo crepe becomes a delicious treasure hunt. Influenced by his Italian-American heritage and his time at resorts like the Greenbrier in West Virginia, Michael Fiorelli creates a confident version of pasta-centric coastal cuisine. The venture is formal enough that a waiter scoops bone marrow over the cavatappi yet lighthearted enough that English muffins with house-cultured butter aren’t out of place. Don’t miss desserts as comforting as warm Italian doughnuts with lemon curd and Nutella. David LeFevre (the Arthur J, Fishing with Dynamite) cuts a swath through genres and latitudes with the gusto of someone who’s clearly pleased to be at the stove. A cooked-down Basque piperade bathes ricotta-stuffed squash blossoms. He grills squid to a pearly transparency, reinterpreting fish-and-chips with lightly battered halibut cheeks. This pier-adjacent chophouse is Tin Vuong’s (Little Sister) most regal project yet. Still, it might be the only steak joint where board shorts don’t get a second glance. Comté-topped tureens of onion soup are fortified with oxtail and brandy. Waiters gush over bona fide Japanese Wagyu.